great post. I own the LM-1 in that flickr set (that set was posted by Matrixsynth after it was posted on ebay and I won that auction). The story I have for that particular LM-1 is that it is one of the first 10 built. I emailed Roger Linn about it and that's his best guess. It has no serial number, no analog filters on the bass or toms, different wiring inside, most IC's are socketed, different metal chassis design, multicolored LEDs, etc. The 3rd knob across the top is a 'Tempo Fine' control, but has some paint overlaying an original labeling that says 'Shuffle.' Roger Linn's best guess (again by email to me) is that he might have planned a rotary switch for the shuffle to go there. Now, in keeping with your ad sequencing, what's interesting to me is that this early LM-1 I've got has the labeling "Linn and Moffett Electronics Inc" which matches the "gold" ad. Moffett was an early co-investor with Roger Linn (that info from Roger and Bruce Forat), who later dropped out of the partnership. 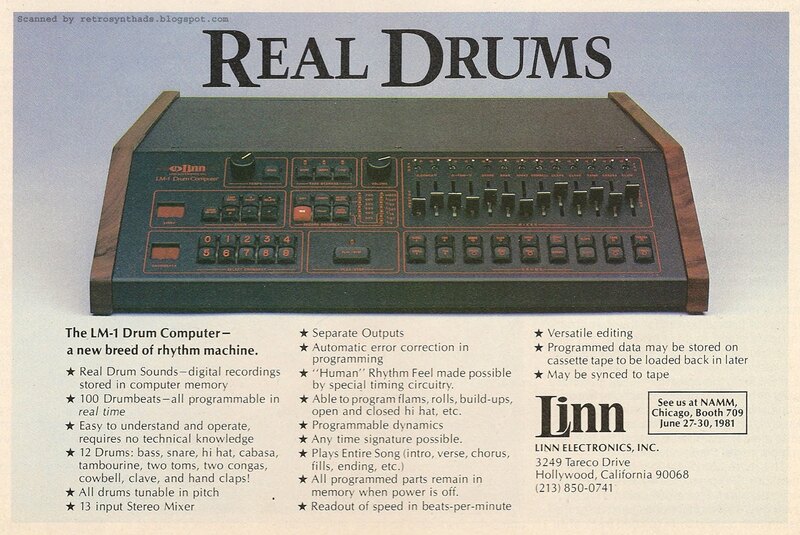 The B/W version of the ad says only "Linn Electronics Inc" across the bottom. So maybe that B/W one is actually later than the one in the "gold" ad, perhaps within S/N 11-35. 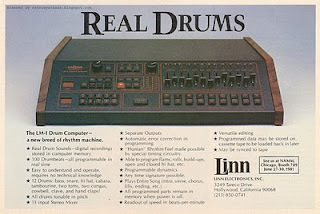 After #35, Roger Linn stopped building them in his apt bedroom. Never too much - that's some great history. Thanks for sharing!